We’re at midcourt, and the ball is about to go up…it’s Monday Tip-Off! 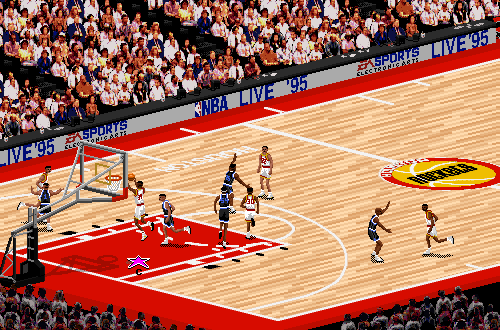 Get your week started here at the NLSC with a feature that’s dedicated to opinions, commentary, and other fun stuff related to basketball video games. When you’ve been playing video games for a long time, you can’t help but marvel when you look back at the games you used to play, and realise just how far gaming has come since then. This is particularly noticeable when it comes to genres that tend to see annual releases, as is the case with basketball games and other spots titles. Sometimes, it’s difficult to notice the changes and truly appreciate the improvements that basketball games make, until you go back and play an old release, or make side by side comparisons. While there’s still room for improvement and innovation, basketball games have undoubtedly come a long way. Most of the improvements are obvious once you make a comparison, and they have been frequently spotlighted and discussed over the years. However, one improvement that arguably remains a little underappreciated is post-release support, specifically bug fix updates and new content. That’s not to say that there aren’t still problems and controversial practices, and I will touch on them as well. But looking back, you can see a steady improvement in this aspect of basketball games, which is encouraging as we look ahead to future releases. So, what has the support for basketball video games been like, then and now? It would be wrong to suggest that basketball titles haven’t benefitted from the same advances and innovations that video games in general have seen over the past twenty years. Likewise, they’ve suffered from the same limitations. A long time ago, official patches weren’t that common, had to be sought out manually, and were basically exclusive to PC gaming. When it came to console games, you were out of luck…unless a fixed version was produced for the next run of copies, which certainly did happen with some games. 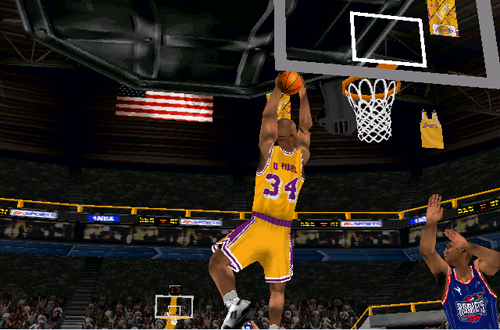 For the record, NBA Live 95 PC did have a couple of official fixes, which you can still find in our Downloads database. It wasn’t until around NBA Live 98 that we started seeing official patches – also commonly called title updates, these days – which actually addressed issues with the core features and mechanics of the game. Before that, most patches were simply technical fixes for compatibility issues with hardware or gamepads. As it stands, NBA Live 98’s official patch addresses seven listed issues, which pales in comparison to the patch notes we see when major title updates come through for NBA Live 16 and NBA 2K16. Content updates were also pretty much unheard of for basketball games at that time, outside of the unofficial ones made by our community. Official patches were also something that we really had to push for, back then. NBA Live 99 is, in my opinion, an underrated game, saddled with an unpopular cover player (Antoine Walker) and affected by the lockout that cut short the 1998-1999 season. However, it did have various gameplay issues out of the box, so Tim, Lutz, and Brien actually sent in a petition on behalf of the community, asking EA Sports to develop a patch. Their efforts were successful, and EA did release official updates for NBA Live 99, addressing some of the main problems. Because of the lockout, NBA Live 99 was released with final 1998 season rosters, rather than being updated for the 1999 season. Therefore, when the lockout was lifted and EA was releasing a fix for the game, they also included updated rosters, adding the Class of 1998 rookies. In fact, they also went ahead and released a second roster update, accounting for the moves at the trade deadline. For the first time, new content was being officially added to a game, post-release. The official updates for NBA Live 99 even added the 50-game schedule for the 1999 season. After that, it would be some time before we’d start seeing regular bug fixes and new content in the NBA Live series. Infamously, and very controversially, a planned fix for the PC version of NBA Live 2001 fell through. As you’d expect, the community wasn’t happy, expressing discontent that grew even larger when NBA Live 2002 ended up being a console-only release. NBA Live 2003, 2004, and 2005 all received official patches that addressed some key problems, but didn’t add any new content, nor make significant upgrades to modes or gameplay. Following a troubled release, NBA Live 07 PC received an update that resolved a couple of problems, but on the whole, it was unfortunately quite underwhelming. Around that time, however, the console versions were beginning to receive better support. With the Xbox 360 and PlayStation 3 offering larger local storage through the use of internal hard drives, and Xbox Live and the PlayStation Network being firmly established, we started seeing a greater emphasis on connected experiences, as well as increased post-release support in terms of both bug fixes and content updates. Unfortunately, this kind of support was non-existent for the PC version. The PC port of NBA Live 08 was outsourced, and we had no luck at all with our requests for a patch. Meanwhile, support for the console releases continued to improve, and title updates tended to make some significant changes. 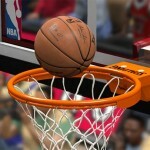 Content updates became more significant; Online Team Play was actually added to NBA Live 08 via an update, as it was not included out of the box. NBA Live 08 also had quite a few official roster updates, and one of NBA Live 09’s marketing slogans was “Made Fresh Daily”, with daily roster and Dynamic DNA updates courtesy of EA’s new partnership with Synergy Sports. While major improvements and additions would need to wait until the next release, more was being done with the games in the meantime. For those who don’t remember, when NBA Elite 11 was cancelled, NBA Live 10 actually continued to receive roster updates through the 2011 season. While NBA Live 14 was still ultimately a rough game after a couple of patches, some nevertheless impressive work was done with it, post-release. Glancing over at NBA 2K’s update history, it was also receiving bug fixes and roster updates, with one of the patches for NBA 2K10 PC essentially making it the “definitive” version of the game, thanks to its extra fixes. The only downside was that the PC patches were coming a long time after the console updates. Today, both NBA Live and NBA 2K tend to receive multiple comprehensive title updates each year, addressing issues, resolving bugs, and often adding some new content at the same time. There’s a strong effort to put extra work into the games, even after they’re released, and patches are more of a given. Both games also receive roster updates, with NBA 2K’s coming through a little more frequently, and tending to be more complete. 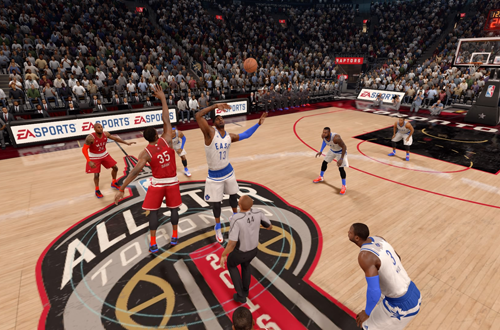 Content updates include new faces, courts, jerseys, and even animations, in addition to the current rosters. As I’ve mentioned in previous articles, I also like what both EA and 2K have done in handling ratings updates in NBA Live 16 and NBA 2K16. There’s also new content for Ultimate Team and MyTEAM coming through every week, and NBA 2K12 even received some downloadable content in the form of the Legends Showcase. I should also mention once again that Leftos was very active in the NLSC Forum after the release of NBA 2K16, helping out with some support for the PC version. When you take a look back, support for basketball video games really has come a long way, taking advantage of new technology and increased interaction between gamers and developers. Needless to say, there are still problems here. AAA games basically requiring a day one patch is a controversial matter and a sore point for a lot of gamers. In all fairness, basketball video games (and most AAA games, for that matter) are more complex than they used to be, and while our expectations are higher, the development cycles aren’t necessarily any longer…especially for NBA Live and NBA 2K. There are also updates that unfortunately seem to cause more problems than they resolve, as well as dissatisfaction with roster and content updates, and so on. While some of the circumstances are understandable, there are also legitimate complaints and situations where basketball gamers are rightfully dissatisfied. Still, it’s been great to see the post-release support and content updates for basketball games evolve and improve through the years, as the games themselves have become better. I like the fact that we have open lines of communication with the developers to report issues, as well as make suggestions for the next game. While I do hope to see further improvement in the title and content updates in the future, I’m also glad that we’re getting the kind of post-release support that we are now. It’s a long way from a couple of audio and gamepad fixes on one platform.